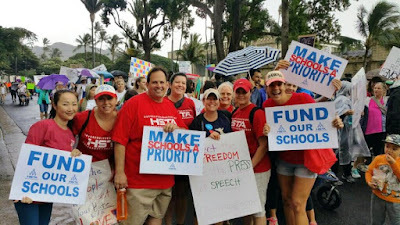 The teachers union has again set its sights on generating more taxes to increase funding for Hawaii public schools. This time, it’s eyeing residential investment properties and visitor accommodations. Star-Advertiser. The Hawaii teachers union is asking the Legislature to approve a constitutional amendment that would establish a statewide surcharge on residential investment property and visitor accommodations. Civil Beat. The Hawaii State Teachers Association believes taxing two areas would raise millions of dollars to recruit and retain teachers, reduce class sizes, pay for special education and fund educational programs.Hawaii News Now. U.S. Rep. Tulsi Gabbard defended her trip to Syria and meeting with President Bashar Assad on Wednesday, saying that it’s impossible to broker any kind of peace deal without talking to the country’s leader, who has been accused of war crimes and human rights violations by lawmakers and human rights organizations. Star-Advertiser. Back from her mysterious trip to Syria during inauguration week, Hawaii Congresswoman Tulsi Gabbard confirmed reports Wednesday that she had met with Syrian President Bashar Hafez al-Assad. Civil Beat. Tulsi Gabbard, a congressional Democrat just back from a weeklong trip to Syria defended her meeting with the war-torn country's president, saying Wednesday there's no possibility of a viable peace agreement unless Bashar Assad is part of the conversation. Associated Press. Tulsi Gabbard Posts Video From Secret Trip To Syria. Big Island Video News. Congresswoman Tulsi Gabbard returned to Washington, DC after a week-long visit to Syria with a renewed and greater resolve to end the war there. Maui Now. Medical marijuana licensees can begin cultivating their crops next week, the state announced Wednesday. But exactly when patients can begin purchasing products is still unclear. Hawaii News Now. Hawaii officials are proposing several rule changes for state harbors in response to ongoing concerns, including limitations on alcohol consumption and a ban on feeding wildlife and feral animals. Associated Press. On a per-patient basis, Hawaii was ranked No. 16 in Medicare waste, with an average overpayment of $11.31 per patient, and overpayments totaled $1.47 million for 2015, compared to just under $5 million in 2014. Pacific Business News. New data from the state Campaign Spending Commission shows 2016 highlights. Civil Beat. Despite calls for reconciliation and peace, the fractured Office of Hawaiian Affairs Board of Trustees is likely to engage in even more skirmishing next week, possibly including an attempt to topple Chairwoman Rowena Akana from her leadership role. Star-Advertiser. Commentary: With so much to do and so little time to get it done, why in the world would Souki and other key legislators pick another unnecessary fight with the Hawaii State Judiciary? But that’s exactly what it appears they’re doing. Civil Beat. Hundreds of volunteers have been canvassing the streets across the state. They’re counting homeless individuals and families for the annual Point-In-Time Count. Hawaii Public Radio. Those flimsy, hard-to-read paper bus transfer slips soon will be a thing of the past while all-you-can-ride, one-day passes will be the future under a bill passed 9-0 by the Honolulu City Council on Wednesday. Star-Advertiser. A federal judge says the lawyer representing Honolulu Police Chief Louis Ke­aloha against possible federal criminal charges cannot also represent two people suing the city and three former police officers. Star-Advertiser. Myles Breiner has filed numerous lawsuits attacking the credibility of the Honolulu Police Department, the chief and his prosecutor wife. Now he’s representing the couple. Civil Beat. The Honolulu Police Department is going through changes with its chief of police, Louis Kealoha, retiring in about a month. KHON2. Work crews started striping new two-way bike lanes on McCully Street this week — the latest step in the city’s gradual efforts to make Honolulu more bike-friendly, and to encourage more of its residents to get around by bicycle. Star-Advertiser. A bill to prohibit most commercial activity at five Waimanalo beaches was approved by the Honolulu City Council on Wednesday. Civil Beat. The developer of Hawaii’s largest solar farm said it has begun pumping power to the grid. Star-Advertiser. A permitting dispute is intensifying on Oahu's North Shore, where city officials have issued a third notice of violation for a controversial commercial development near Sharks Cove. Hawaii News Now. INspiration Interiors is expanding to West Oahu with a new location in the former Sports Authority space at the Target-anchored Kapolei Commons shopping center, Pacific Business News has learned. A County Council 8-1 confirmation vote Wednesday made Joe Kamelamela the county’s top civil lawyer. West Hawaii Today. A handful of bills that would facilitate clearing albizia trees from private property passed their first readings in the state Legislature. Tribune-Herald. The Hawaii County Council on Wednesday voted unanimously to pass a nonbinding resolution again asking the Legislature to put money in the budget for lifeguards, a lifeguard tower and necessary equipment at Kua Bay. West Hawaii Today. Hilo businessman Ken Fujiyama and his company still owe about $6.1 million to a North Carolina bank that held mortgage on the then-Naniloa Volcanoes Resort, according to a complaint filed in Hilo Circuit Court. Tribune-Herald. Developer wants to nix public access after county fails to purchase land. Maui News. A second-chance hearing for an unpermitted zipline company in Haiku was unanimously denied by the Maui Planning Commission on Tuesday. Maui News. In his quest to create a secluded, tranquil estate on Kauai, Facebook CEO Mark Zuckerberg has run into a messy problem that involves publicly advocating for something Native Hawaiians often regard as an injustice equated to stealing land. Star-Advertiser. Heirs of kuleana land on Zuckerberg property say they’re not selling. Garden Island. A second extension for a storm water permit has been denied for a proposed dairy on Kauai's south shore. Hawaii News Now. Kauai’s pesticide legislation, Ordinance 960, was repealed Wednesday through the approval of Bill 2643 upon second reading during a Kauai County Council meeting. Garden Island. The Kauai County Council unanimously voted to “clear the books” of an invalidated county law the courts had struck down requiring biotech companies to disclose pesticide use and regulate the growth of genetically modified organisms. Star-Advertiser. There will be no county-sanctioned drinking alcohol on the links anytime soon at Wailua Golf Course. Garden Island. Lihue Post Office may close: Site may be consolidated with facility off Kapule Highway. Garden Island. Man and woman seriously injured in Waikiki car crash - Two people were taken to a hospital after they were involved in an early morning crash in Waikiki.